To me, nothing heralds the arrival of Summer better than fresh, juicy berries coming into season. Our suppers have always been influenced by seasonal variety. Long Summer days were spent in the woods on the way from the beach, picking wild blue and alpine berries. My Granddad’s garden also provided some of the most flavourful wild raspberries protected from the birds and me by the plant’s thorny branches. I didn’t mind the scratches, and I would happily spend hours munching away on the fruits in the warm afternoon sun. And while the French used what nature provided for their mixed berry soup, we took comfort in our blueberry and cream dumplings and strawberry spaghetti. With that amount of pasta, you could almost be excused for thinking we were Italians… But what a pasta it was! Light, and fragrant and delicious. Never a chore to eat. For a more modern, and perhaps grown up version, I have added some pomegranate seeds and fresh spearmint. They also add a bit more texture and a burst of colour to the dish. To be honest, I would happily have this any time of the day: breakfast, lunch, dinner or even dessert when a scoop of creamy vanilla, or better yet, chocolate ice cream could be added to make it that much more special! If you don’t like mint, you could use basil in this recipe. Quark, cottage cheese or mild feta are added for extra sustenance and to help balance the sweetness of the flavours if you wish. Prepare the angel hair spaghetti according to packet instructions. In the meantime, prepare the strawberry and pomegranate sauce. To make the sauce: chop strawberries into small dice. Add cream and mix well, squashing with the back of a fork to release some of the juices. Tear mint leaves into the sauce, add pomegranate seeds and cheese. Add sauce to the drained pasta and mix well. Spoon spaghetti into the mould and turn out onto a plate. 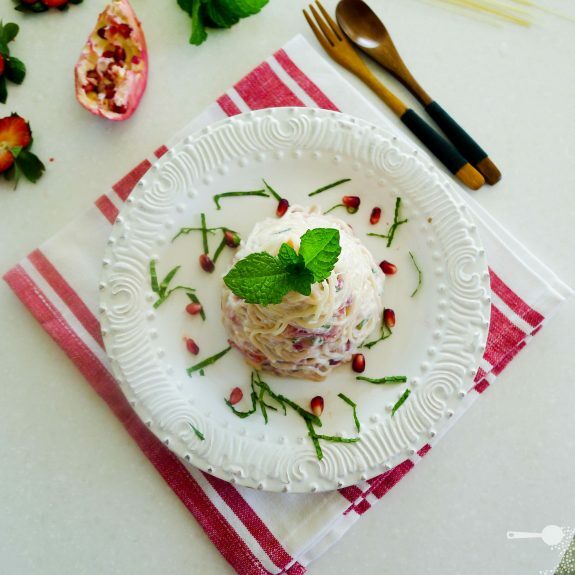 To serve: sprinkle around with some pomegranate seeds and garnish with a mint leaf or two. Sorry for asking a stupid question: is this a dessert? I’ve heard about pasta being used in dessert but have never tried it, not yet anyway. It can be a dessert if you like. We used to have it for supper or instead of dinner actually. But it would make a yummy breakfast or lunch too! Wow! I would have never ever expected spaghetti to be a dessert! Great work! Dessert for breakfast? Yes please! Adding feta to this soudns great. Sounds so fresh and tasty. Amazing combination and I like how in a cone shape it looks so much more posh. Looks awesome. And very conical. I’m telling you, you’ll never eat flat again. I know! Everytime I think of making something for lunch or dinner I think “can I make it into a cone”? Might be an idea for a Royal Selangor cone-shaped food blog in its own right! This looks yummy! Perfect for a warm day like today. Great use of the mould too, to sculpt the tower. Wow, this looks fantastic!!! I love your unusual combination, it makes for a very pretty dish. I love that jelly mould!!!! I just can’t imagine how this tastes!!! It really is quite intriguing. You are one of the most creative people in this competition, seriously! Your skills and culinary imagination amazes me. Great dish. ok this is awesome..spaghetti as a dessert?? GREAT!! I’m in awe of your creativity and delicious dishes in this challenge. Love this mould as much as you do. Great recipe! Thanks for sharing – and presentation is very pretty too. The mould is so versatile, you have really let it shine in your posts! The strawberry spaghetti yo talk about vaguely reminds me of the dish I sometimes tasted at friends’ houses. We have never had since we were all (apart from my mum) horrible carnivores 😉 Pomegranate and mint make it very elegant and complex. Another extraordinary idea! Wow, the pairing with the pomegranate and strawberry makes this really festive, pretty, and unique looking! I’ve never tried that pairing of flavors before. It sounds good. I’ve never heard of “dessert” spaghetti! Oh my gosh, this takes me back to when I stayed with my grandparents and we use to make this style of pasta and dumplings. My grandfather would often eat noodles doused in poppyseeds and icining sugar. Oh my… this pasta is a total piece of art. I think any Italian restaurant that serves pasta will be like “WOW!” Yeah this is totally a new generation of how you serve pasta! 😉 I love it. This is my first time seeing strawberry in pasta! This is new to me but it looks yummy. I never tried fruits with pasta (very unusual in our country) but this looks yummy!